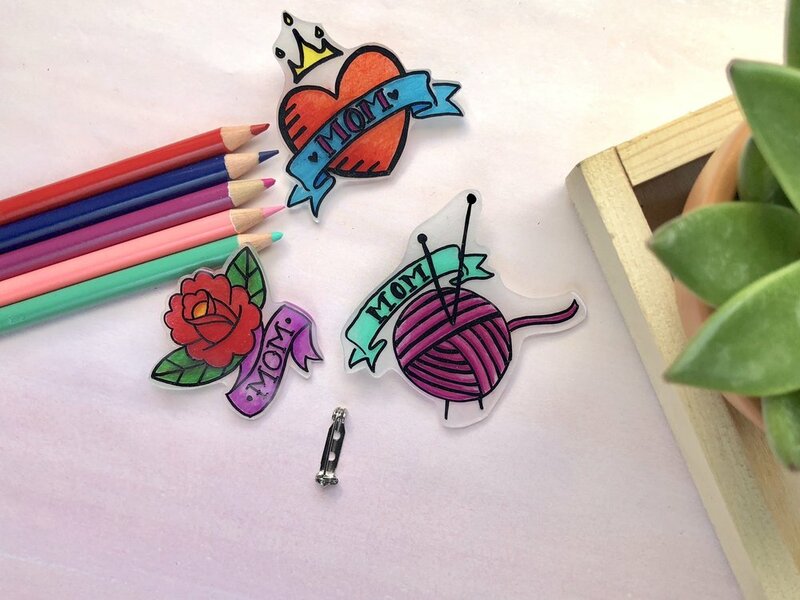 We've been thinking A LOT about getting new tattoo's which inspired us to make Shrinky Dink Mom tattoo pins for Mother's Day!!!! Is it possible we love Shrinky Dinks even more as grown-ups than we did as kids? YES! Each package of Shrinky Dinks will have specific directions to follow but here's the gist...we searched Mom tattoos on goggle, printed them out 4X larger than we wanted them, traced and colored them on Shrinky Dink paper. We cut out the tattoo's and baked them on a pan lined with parchment paper in a preheated oven to 325. Pro tip- Check them often, they will shrink, curl and then lay flat. Once flat count 30 seconds and remove from the oven. If the pieces are still a little curled, press down. Careful, it's HOT! To help from smudging we sealed with spray sealant. After they were dry, we hot glued a pin backing. Ready to wear ready to share! Mom's gonna look so badass!